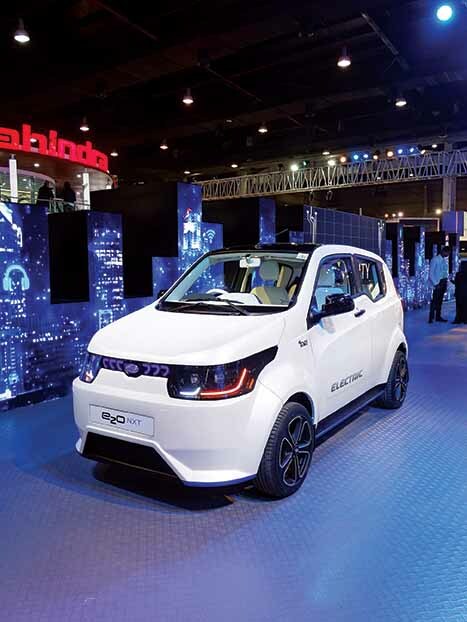 The 14th edition of Auto Expo (2018) provided a glimpse of the future of mobility. The 14th edition of Auto Expo 2018 was a success. 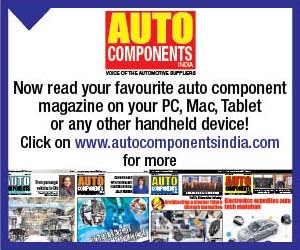 Providing a glimpse of the future of mobility, the biennial motor show, organised by Automotive Component Manufacturers Association of India (ACMA), Confederation of Indian Industry (CII) and Society of Indian Automobile Manufacturers (SIAM), witnessed the participation of 1319 (119 at the motor show) companies. The motor show, held from February 09 to February 14, 2018, at the India Expo Mart, Greater Noida, reflected on the change in industry sentiments. Conveying a positive sentiment, the premier fair turned out to be a platform for 500 product displays. Over 22 launches and 81 product unveilings took place. About 18 concepts were unveiled. 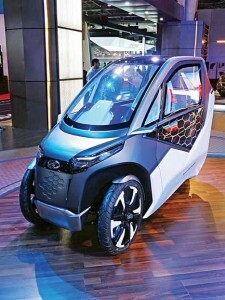 The 14 new launches the show witnessed, pointed at an increasing focus towards green technology. There were 25 electric vehicles at the show. Providing an effective platform for 11 startups, the auto fair saw CV OEMs present new trucks, buses, vans, three-wheelers and more. Reflecting on the changes the CV industry is witnessing in-line with the regulatory influences and market forces, the CVs displayed at the Auto Expo 2018 made a strong business case, and effective commercial viability. Not limiting themselves to address the current expectations, the CVs showcased, dared to provide a glimpse of the future. 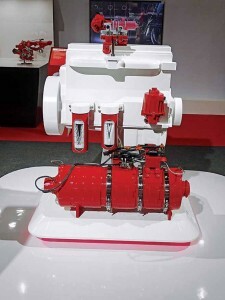 The CVs highlighted the ability of their OEMs; their capability and technological prowess. 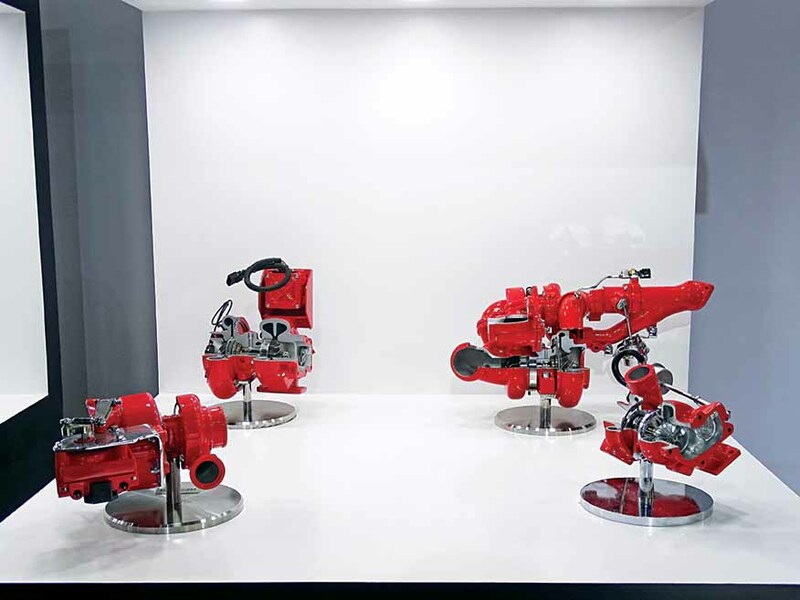 The CVs highlighted the effort of the OEMs to engineer platforms that look far beyond fossil fuels. CVs that are electric in nature. CVs that point to the future of shared mobility, last mile transport and more. 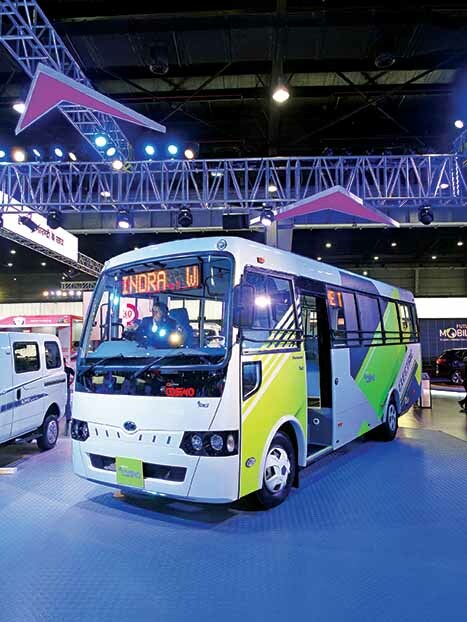 With electric buses making a prominent display at this motor show, the CV industry proved that it is at the forefront of industry transformation. 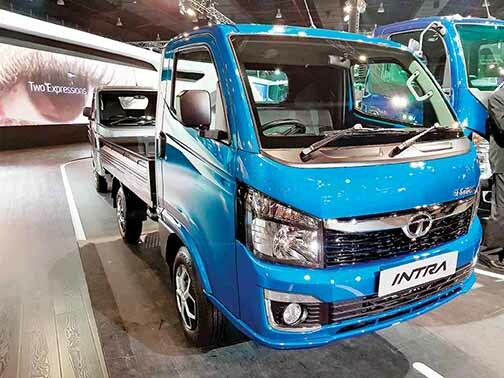 With commercial vehicle population in India pegged at 7.5 lakh units, the commercial vehicles displayed underlined the ambition of the industry to be second to none. With exports from the country expected to grow by five to six per cent in FY2018-19, it would be unfair if the CV industry did not hint at its intention as well as the ability to go global. The prominent CV makers at the fair were Tata Motors, Ashok Leyland, Mahindra & Mahindra, JBM, Lohia Auto, SML Isuzu and others. 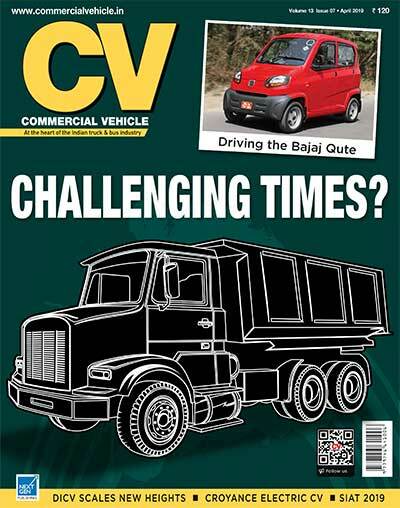 CV application builders and key aggregate suppliers were the MG Group, Pinnacle, Cummins, Greaves Cotton and others. Other than the OEM booths, and key aggregate suppliers, the expo this year had special zones to offer an unconventional perspective, and draw a younger audience. Eliciting the visit of 750 government school children, the fair held a session on the future of mobility. With a spotlight on ‘70 years of Indian Automobility’, an Indo-German joint working group meeting at the fair delved upon the development of industrial synergies between the auto industries of both countries. In the ‘Auto Trade Dialogue’, global industry experts from China, Japan, Germany, Italy, UK and Canada deliberated upon the need to collaborate for the development of driverless, connected and autonomous zero-emission vehicles. A job fair by the Automotive Skills Development Council in association with SIAM is known to have offered a total of 136 jobs in the field of automation and auto ancillaries. A delegation of State Road Transport Undertakings (STUs) also visited the fair. The 12th SIAM Styling & Design Conclave 2018 got experts to share insights on emerging styling and design facets of automobiles. The conclave also had participants talk about sustainability. Described as yet another milestone by Vishnu Mathur, Director General, SIAM, the Auto Expo 2018 brought together the stakeholders of the Indian auto industry under one roof. Providing the right platform to the auto industry to showcase its journey with competitive and world-class products, technology and futuristic concepts, the expo was visited by over six lakh people. Held over six days, the fair, inaugurated by Anant G. Geete, Minister, Heavy Industries & Public Enterprises, Government of India, was a success. Turning out to be a platform for the felicitation of the auto industry for supporting the government in its endeavour to build sustainable mobility, the fair, the union minister during his speech expressed, has become a place that brings together the entire automotive fraternity. 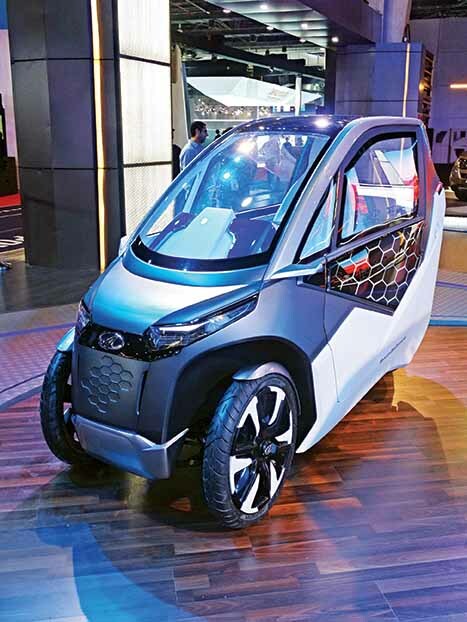 Hinting at OEMs investing ever more in technology and smarter ways of working, the Auto Expo 2018, in part also underlined the government’s ambition to encourage cleaner and less polluting mobility mediums. It was not lost on the industry stakeholders however if it would be only electricity or other equally efficient mediums of energy. Zero tailpipe emissions, after all, are not the only objective! 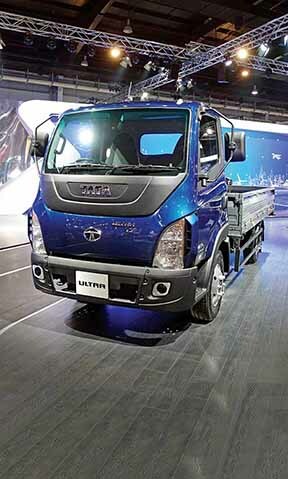 Marking 150th anniversary of the Tata Group, Tata Motors showcased a slew of products. With a stall spanning across 6000 sq. m, Tata Motors’ banked on thematic zones like ‘Smart Energy zone’, ‘Semi-urban zone’, ‘Sports zone’, ‘Inter and Intra-city zone’, ‘Rising city zone’ and ‘Urban high-density residential zone’. These were smartly segregated and targeted relevant customer base of the company. 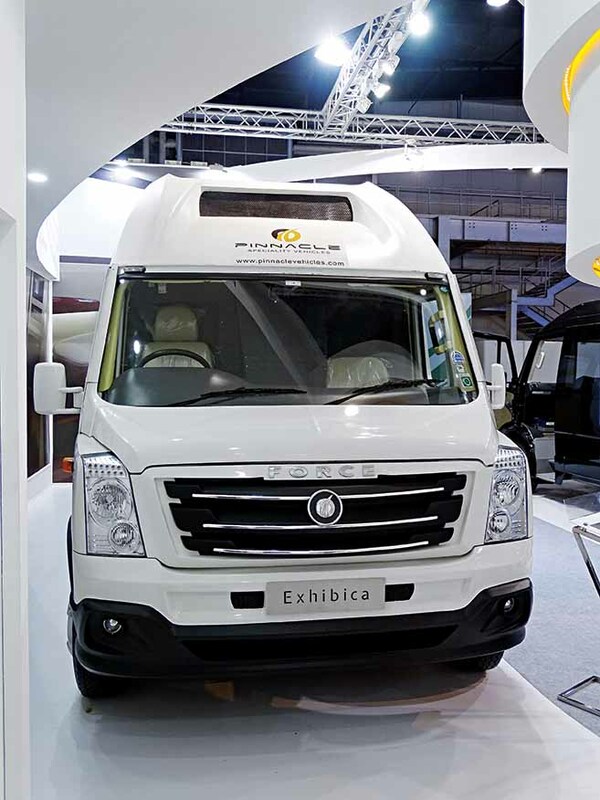 Announcing a new design language for the entire portfolio, commercial vehicles included, the company zeroed on ‘Agile Light Flexible Advanced’ architecture. It is a ground-up architecture that demonstrates engineering prowess, strength and quality. The architecture is claimed to be an outcome of a radical new approach to design. It is thus light in weight, modular and flexible. It is also said to have an ability to give birth to a range of new vehicles in a short time span. 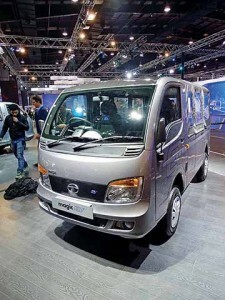 Tata Motors unveiled an all-new ‘Tata Intra’ small commercial vehicle based on a new modular platform and is designed with a passenger vehicle-like cabin. 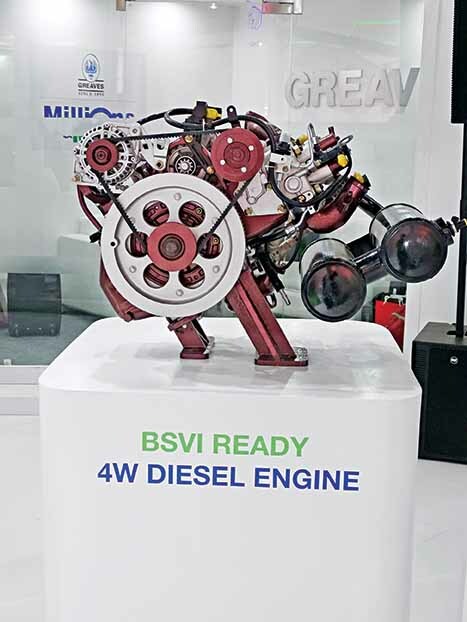 Said to offer superior driver comfort, the vehicle is powered by a 0.8-litre common rail diesel engine that produces 40 hp at 3750 rpm and 96 Nm torque at 1750-2500 rpm. The Intra has been engineered with scalable aggregates and is BSVI ready. 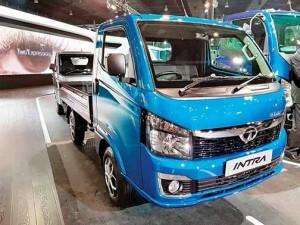 With a Gross Vehicle Weight (GVW) of 2150 kg, the Intra has a rated payload capacity of one-tonne. 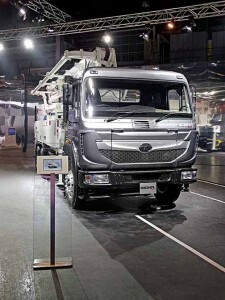 The Ultra T.7 light commercial vehicle Tata Motors displayed, is aimed at the sub seven-tonne goods segment. It features a 1.9 m wide cabin, and an all-new three-litre engine with Variable Geometry Turbocharger (VGT). 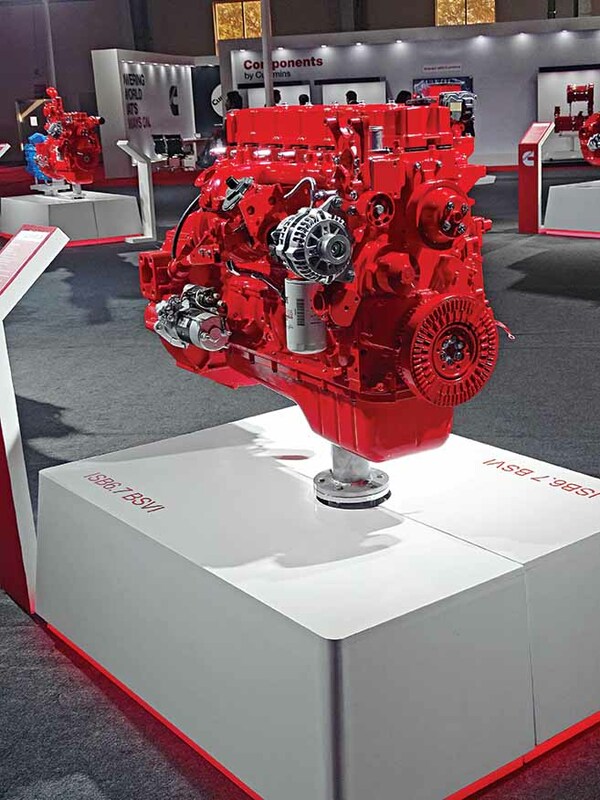 Churning out 123 hp at 2600 rpm, and 360 Nm of peak torque at 1400 rpm, the engine is mated to G400 AMT transmission with Optidrive developed by Wabco. In the people mover category, the CV maker displayed a 12 m front-engine bus called the Magna. 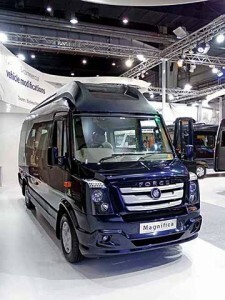 Developed in association with Marcopolo, the Magna is a 16-tonne, two-axle fully-built coach that complies with the bus body code, and is aimed at inter-city travel. In the inter-city link zone, Tata Motors displayed Signa 4323.T, a 43-tonne six-axle rigid truck with a rated payload capacity of 30-tonnes. Aimed at applications across cement, industrial goods, cold chain, coal, FMCG and packed lubes segments, the truck hints at tonnage shifts and the growing needs of operators for superior performance, efficiency and reliability. 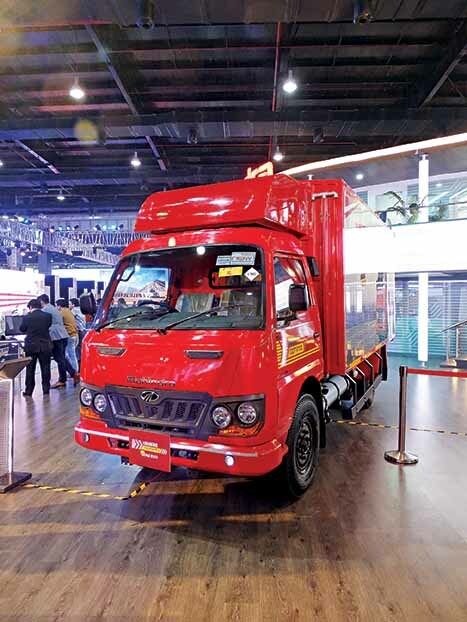 Showcasing Prima 3718 with Haulmaax suspension system developed in association with Tata AutoComp Hendrickson Suspensions, Tata Motors provided a glimpse of new developments in haulage CVs. The advanced rubber based suspension system boasts of an extra wide bolster spring center and a progressive load spring in a bid to offer better stability and a smoother ride. It also reduces maintenance with fewer bushes and eliminates the need for frequent lubrication. Also displayed in the inter-city zone was a Prima 4930.S. The truck features Electronic Stability Control (ESC), lane departure warning system and an autonomous emergency braking system. The smart energy zone showcased an extended range of electric vehicles. This included an electric 12 m Tata Starbus, Tata Magic and Tata Iris electric. Aimed at mass mobility and safe transportation, these people movers found much interest with the visitors. In the alternate fuel segment, the company showcased a Tata Ultra LNG model. 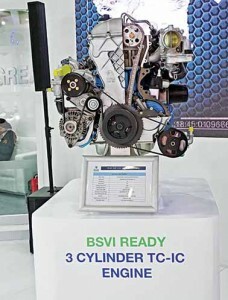 Speaking on the sidelines, Girish Wagh, Head – Commercial Vehicles, Tata Motors, expressed, “There are routes in the country where there is a possibility of having LNG terminals, and this seems to be one area which can actually translate into huge demand.” Other than CVs, Tata Motors also showcased new generation four-cylinder diesel Turbotron engines of three and five-litre capacities. 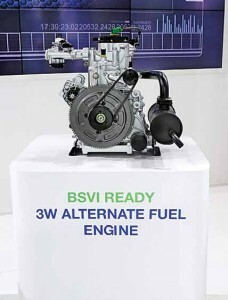 Keeping in mind the upcoming BSVI norms the engines can be scaled up. In terms of the display area and the number of vehicles on display, Mahindra & Mahindra gave a tough fight to Tata Motors. On display were a BSIV 49-tonne Blazo prime mover, Blazo 25 tipper, Comfio BSIV intra-city bus, Bolero pick-up in special application guise and e20 NXT. The crowd puller was a new age mobility solution called the ‘Atom’. It is powered by Mahindra’s new electric powertrain and features swappable batteries to extend the range. Claimed to operate uninterrupted for long hours, Atom is indigenously built last-mile urban mobility solution. Equipped with an intelligent connectivity system, the Atom enables booking and payment module like that of an Ola and Uber. The smart technology of Atom allows seamless connection with multiple transport modes, keeping passengers posted on the next departing train, bus or flight and the nearest boarding points on a real-time basis. Atom packs a host of safety and convenience features. A stylish two-seater electric pod displayed at the Mahindra stall aimed at last mile connectivity. Engineered to offer an enclosed architecture with microclimate control, lighting, touch-screen infotainment and Bluetooth enabled audio system. Insulating the urban commuter from the harshness of the urban environment, the UDO is designed to slash congestion and emissions, and features a ‘smart fitness’ mode that allows occupants to work out while commuting through a ‘smart cycling’ feature. The battery recharges as the occupants pedal, thereby extending the vehicle’s range. Aligning with the philosophy of Anand Mahindra, Executive Chairman, Mahindra Group, to look beyond mobility, and create ‘ease of living’. The tadpole construction of UDO eliminates the need to balance the vehicle with one’s feet unlike a conventional two-wheeler. 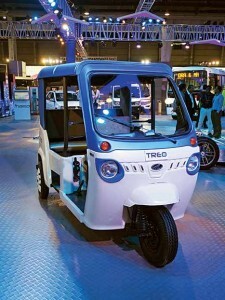 Pointing at the UDO and the Treo, an all-new Lithium ion battery powered electric three-wheeler developed to facilitate last mile moment and connectivity in tier 1, tier 2, and tier 3 cities, Mahindra mentioned that there is a need to look at collaborative ways and invest in shared mobility. The e-Cosmo electric bus the company displayed, is fitted with a direct drive motor developed in partnership with TM4 of Canada, a renowned player in the global EV eco system. Said to feature a reliable electric powertrain with a sophisticated battery management system, regenerative braking system and many more features, the electric bus emphasises on driver and passenger comfort. It also ensures low total cost of ownership and can be configured to include a variety of seating options. A subject of attention was the BSIV Blazo 49 prime mover. 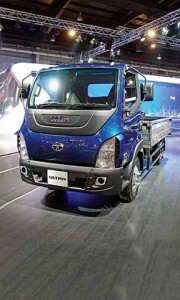 It is built to offer high payload and best in-class fuel efficiency. 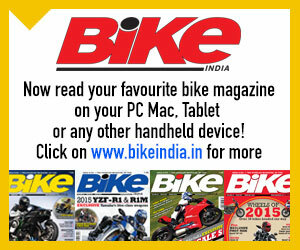 The Blazo 49 features tubeless tyres with alloy wheels, reverse camera, and lock and drowsiness sensors. Powered by mPower 7.2-litre FuelSmart engine, the truck develops 274 hp at 2200 rpm, and 950 Nm of torque at 1100-1700 rpm. The engine is mated to a ZF nine-speed transmission with crawler gear. 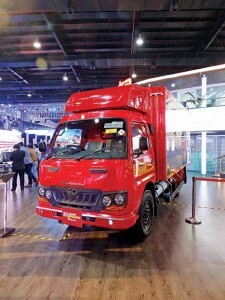 Apart from an Optimo CNG container truck, Mahindra showcased a Comfio BSIV bus (aimed at staff, school and tourist application), Jeeto mini van, Supro truck in a water carrier van and ambulance guise, and Bolero pick-up as a special application road sweeper. 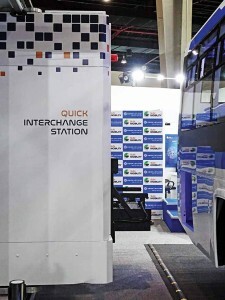 Ashok Leyland and Sun Mobility announced a partnership to create smart mobility solutions. These would be in the domain of electric mobility. 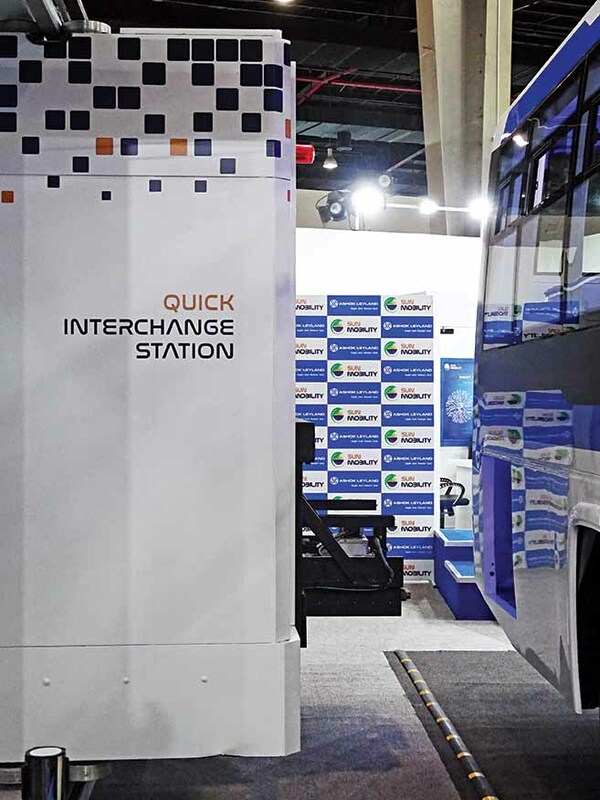 Showcasing the 9 m Circuit-S electric bus with a travel range of 120 kms on a single charge under standard test condition, Ashok Leyland highlighted Sun Mobility’s swappable smart battery solution. The smart battery pack as part of the solution is claimed to weigh one fourth the weight of a regular lithium-ion battery, and can be swapped through a ‘Quick Interchange Station’ in under four minutes. Monitored by a smart network, the swap aids fast refueling, on-demand charging, and leads to the occupation of less space. The process is claimed to be faster than conventional refueling. With an emphasis on addressing charging bottlenecks for electric vehicles, Ashok Leyland, it is clear, is looking at a complete electro-mobility ecosystem, and right down to a stage where the bus spends least time in the depot getting a driver change and replenishment of fuel. Compatible across bus platforms, the business model that Ashok Leyland is looking at offering works on a pay per battery consumption basis. Mentioned Chetan Maini, Co-Founder and Vice Chairman, Sun Mobility, that by separating the battery from the bus helped realise the immense potential to bring down the upfront cost of an electric bus. He indicated that the upfront cost could be brought on par with that of a conventional diesel bus. 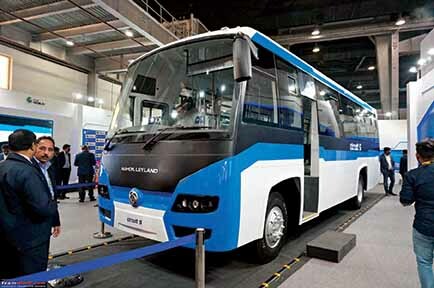 The Circuit-S electric bus that Ashok Leyland displayed can seat up to 35 people and is aimed at intra-city transport applications. 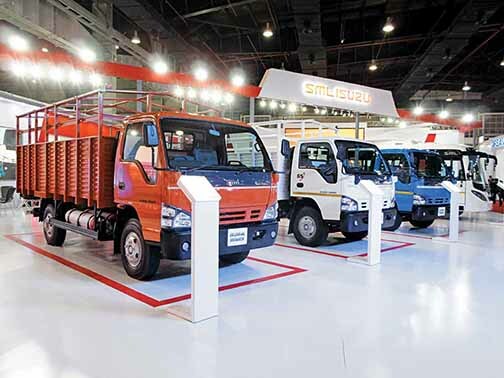 SML Isuzu Ltd. showcased four new products across cargo and passenger space. The trucks the company displayed were based on Isuzu’s global expertise and design philosophy – the Global Series (GS). 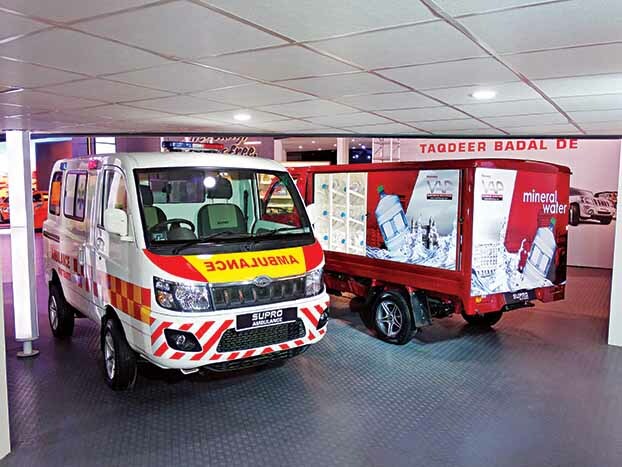 These included the Samrat GS HD19, Sartaj GS turbo-CNG, and Samrat GS tipper. The Samrat GS tipper is powered by a four-cylinder 3455 cc common-rail turbocharged and intercooled engine producing 115 hp at 2600 rpm and a peak torque of 400 Nm at 1500 rpm. The tipper is fitted with an EGR-based exhaust gas aftertreatment. Equipped with a five-speed transmission, the tipper, weighing 9.5-tonnes, is equipped with a pneumatically operated PTO. The cargo dimensions of the superstructure are 3195 mm x 2000 mm x 710 mm. The superstructure body could support a capacity of 4.5 cu. m.
The Samrat GS is a 10.2-tonne truck with the same engine as the Samrat GS tipper, and churns out 101 hp at 2600 rpm, and 310 Nm torque at 1500 rpm. The truck offers 5800 mm x 2060 mm x 1695 mm cargo space, and is claimed to be re-engineered according to Eiichi Seto, CEO and MD, SML Isuzu, to operate in extreme, dusty conditions. The air cleaner of the truck, said Seto, has been repositioned, and reduces dust suction. The Sartaj GS truck showcased by SML Isuzu was powered by a 100 hp CNG turbocharged and intercooled engine that develops 107 hp at 2800 rpm and 315 Nm peak torque at 1600 rpm. 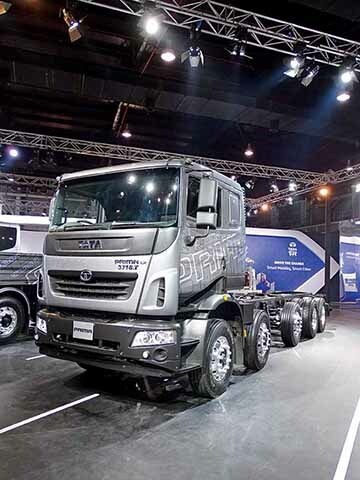 Weighing 7.2-tonne with cargo body dimensions of 4270 mm x 2060 mm x 1695 mm, the truck is aimed at markets where CNG is preferred over diesel. 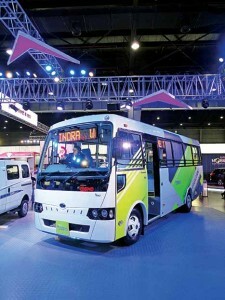 The Executive LX bus the company displayed, is also powered by a CNG turbocharged engine. The bus comes in three different seating configurations (19+D+1 pushback, 27+D+1 with semi reclining seats and 29+D+1 with semi reclining seats), and features ABS and a parking sensor with reverse camera. Claimed to have received a positive response across the country, albeit in the diesel guise, the bus is the first to employ the new GS design philosophy. 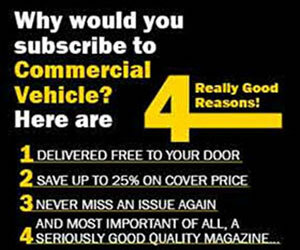 This philosophy will be extended to the entire LCV and ICV range. Apart from technical upgrades, the new GS design philosophy involves new elements like a redesigned grille, redesigned headlamps, bigger side view mirrors and an improved front chassis frame. At Auto Expo 2018, the company also launched an advanced telematics solution called SML Saarthi. It has been jointly developed with Minda, and offers comprehensive service and fleet management support. According to Seto, all GS Series trucks and buses starting April 2018 will be fitted with SML Saarthi. 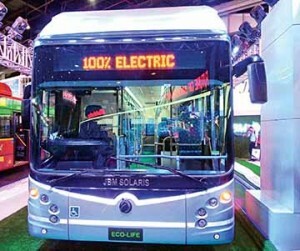 JBM Solaris displayed a 12 m Eco-Life electric bus. Jointly developed by JBM Auto and European e-mobility specialist, Solaris Bus and Coach S.A., through a joint venture, the Eco-Life city bus is 100 per cent electric, and manufactured at Faridabad. Having a corrosion resistant monocoque structure and aluminum side panels for higher rigidity and high torsional stiffness, the bus has been designed as per the European standards and follows the safety norms for the frontal collision, roll over and side impact. Employing high strength glass fibre composite parts at the front, rear and top, the bus employs an inverted portal axle. The design allows for more room inside. 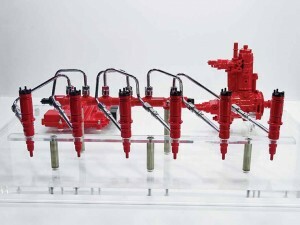 Suspension is pneumatic, and is electronically controlled. Front suspension is independent. The rear has double pneumatic springs coupled with an anti roll bar. Expected to save 3.5 lakh litres of diesel over ten years of operation, the Eco-Life bus is claimed to save 959 equivalent tonnes of carbon dioxide. The direct drive electric powertrain gets a traction motor that delivers 160-215 kW power and has been designed to interface with standard rear differential without requiring an intermediate gearbox. Based on the traffic conditions, the Eco-Life bus is claimed to have a range of 150-200 kms over 10-15 hours of city bus operations. At the heart of drive systems are four-pole asynchronous traction motors and lithium ion batteries controlled by traction controller and battery management system. The design is such that the batteries feed the traction controller which in turn controls the traction motor. Powered by the fast charging lithium ion batteries, the bus can be recharged through a pantograph and plug-in systems, allowing the bus to opt for differing infrastructure that the operator might possess. The components that are conventionally fed by compressors, powered by an internal combustion engine, have been replaced with electric counterparts in the Eco-Life. The batteries thus are no longer an electric energy source for the motors only, they are also a source of energy for the auxiliary systems including HVAC system, air compressor motor and power steering motor through a High Voltage Switching Station (HVSS). 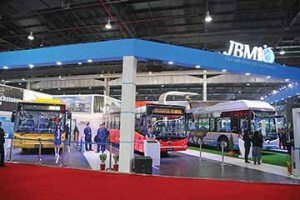 Stating that India has close to 80,000 buses which should convert to electric in the next eight years, Nishant Arya, Executive Director, JBM Group, expressed that they are looking at various developments where the government’s prime focus is on public transportation. “We will soon launch a nine-meter electric bus,” he said. 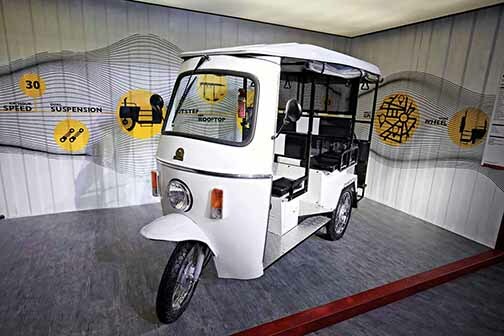 Lohia Auto Industries showcased six electric vehicles. Designed for passenger and cargo transport, in rural and urban areas, the vehicles comprised of Comfort E-Auto HS electric, a dual power e-rickshaw Humrahi Plus, Comfort Lxi and Narain LC (passenger and cargo). 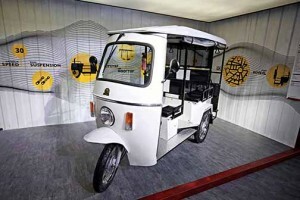 The Humsafar DLX (passenger) and Humsafar 2000 (cargo) three wheelers the company displayed are powered by a diesel engine. The showstopper at the Lohia Auto stall was the high speed Comfort E-Auto HS powered by a lithium-ion battery. 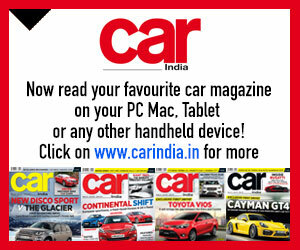 It is designed and developed indigenously, and has a seating capacity of four (plus driver). There is space for load carriage too. Powered by a 78 Ah battery, the Comfort E-Auto HS can be charged by a 48-volt 40 Ampere SMPS charger in two and a half hours. On a full charge, the vehicle can travel a distance of 80 kms. The top speed of the vehicle is 30 kmph. Mentioned Ayush Lohia, CEO, Lohia Auto Industries, that the company is adding more value to its products in terms of speed, power, technology and reach. “Innovation and affordability are always at the forefront when we design a new product,” he said. Providing a glimpse of this philosophy was a new hydraulic type front shock absorber and a rear shock absorber the company displayed on its vehicles. They comprise of leaf springs in addition to a hydraulic (telescopic) damper with spring. Pinnacle Speciality Vehicles, a division of Pinnacle Industries Limited created quite a buzz at the fair. The company showcased Finetza, a class expandable motorhome that is claimed to be India’s first and best motorhome on wheels. Defining ultimate finesse and style, the motorhome aims at those who are looking for a smart, slick and swanky motorhome. 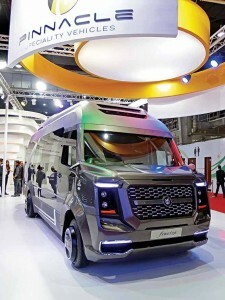 Also aimed at those who are looking beyond SUVs, sedans and regular vans, Finetza, as a motorhome, could be seamlessly converted into an office, a guest house, or an entertainment room. Based on the Force Traveller T2 platform, which is a monocoque body construction with 4020 mm wheelbase, and features a common rail BSIV FM 3.2-litre diesel engine, the Finetza, as a seven seater, four sleeper vehicle attracted much attention. The modern exterior of the Finetza with a revamped front fascia, chrome trim accents, side cladding, roof cladding, fixed glass, rear expandable console, ORVM camera and DRLs drew a crowd. The interior of the vehicle comprised of accents and designs, and plush carpet flooring. Split into a lounge and bedroom setup, the motorhome, in the lounge guise, featured two sofas with seating for five, a slide out coffee table, smart LED TV and an entertainment system with individual reading lights. In the bedroom guise, the motorhome featured a three-seater sofa that could be converted to a full sized bed with a rear expansion control. A soft touch motorised roof and curved LED TV uppe the glamour quotient. Ambient and mood lighting, touch panel and mobile operated interior controls, a pantry with 50-litre refrigerator and a coffee machine added additional flair to the plot. 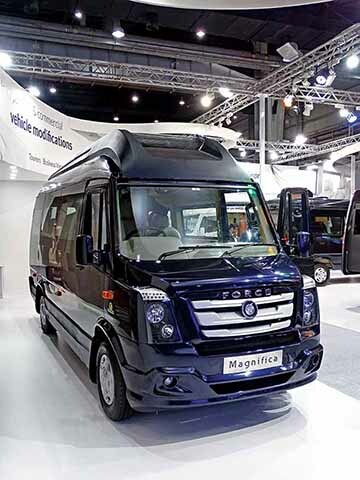 Costing Rs.15-25 lakhs for the motorhome; Rs.50 lakhs for the expandable variant basis customer requirement on a case-to-case basis, the Finetza added a new dimesion to the customised vehicle segment. Pinnacle Speciality Vehicles also showcased the ‘Opisia’, a customised office on wheels; ‘Magnifica’, a modified tourer, and ‘Exhibica’, a custom product display van aimed at leveraging the potential of the global recreational vehicles market. The global recreational market is forecasted to reach 770.5 thousand units by 2022. 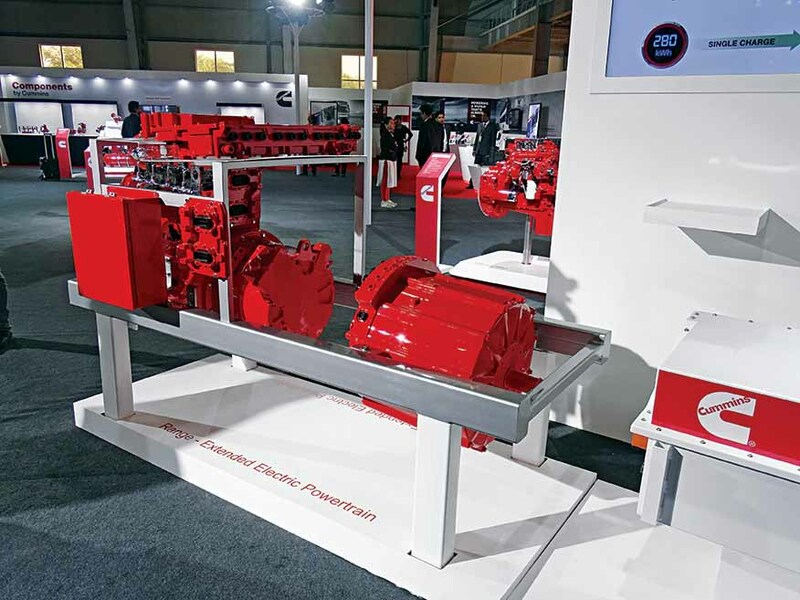 Greaves Cotton Ltd., in-line with the rising demand for alternate fuel and electric transmission systems, displayed two new powertrain solutions for last mile mobility. These include a BSVI compliant, multi-cylinder turbocharged intercooled diesel powertrain and a CNG powertrain. Both are built in technical association with Pinnacle Engines and Altigreen Solutions. Expected to help many OEMs to make the transition to BSVI emission norms by 2020, the powertrains would find use with over 30 OEMs in the three-wheeler and micro four-wheeler space. 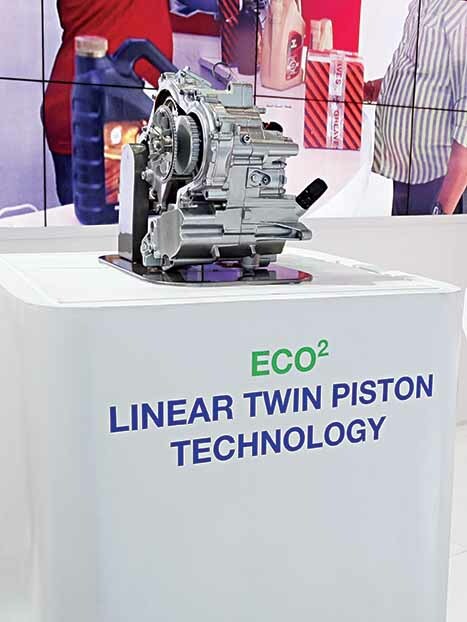 For CNG and Petrol powered three-wheelers, the company took the wraps off the linear twin piston technology it has developed in partnership with Pinnacle Engines, USA. The company also showcased technology in the form of a power plant, which is claimed to offer 30 per cent higher fuel efficiency over a conventional fuel engine. For the last mile transportation aftermarket, the company featured ‘Greaves Care’. An organised set-up, ‘Greaves Care’ is claimed to offer high quality repairs, a wide range of high quality aggregates at the hands of trained mechanics with a post service cover-up of upto six months. To provide an insight into what it does, the company put up a VR booth. Away from its core area of activity, Greaves Cotton displayed a futuristic three-wheeler EV concept – E3. 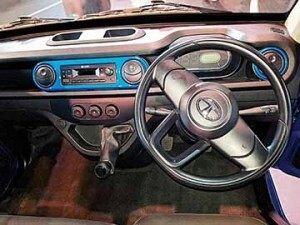 The composite body of the concept is designed and built by the MG Group. The concept combines a well styled light weight body, with the Greaves Altigreen drivetrain technology to deliver high performance with a low total cost of ownership. 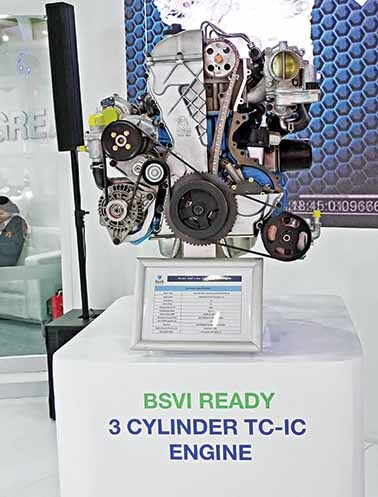 Cummins India displayed new BSVI emission compliant engines, turbocharger technologies, exhaust aftertreatment technologies and solutions. 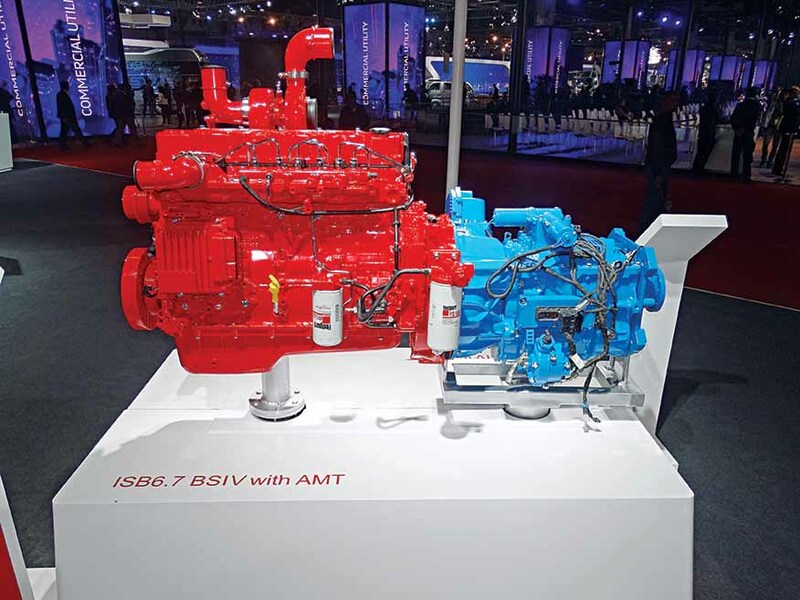 Based on a non EGR architecture designed to reduced system complexities, and to provide better value to the customers, the new engines are claimed to be powerful, and provide high torque density. The engines are also claimed to offer superior reliability and extended service intervals. 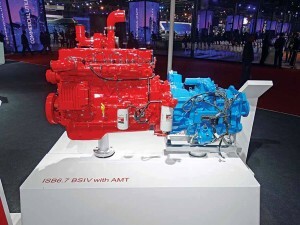 Of the products Cummins displayed, it were the ISB 6.7-litre engine, a common rail fuel system HE150 wastegate and HE200 variable geometry turbochargers, a flex module, and a range-extended electric powertrain that drew attention. 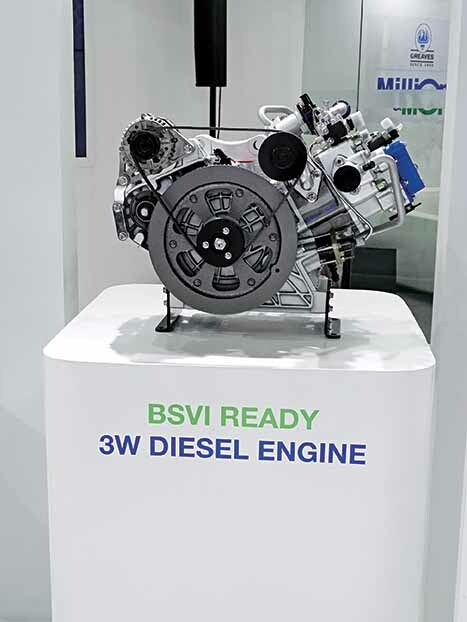 The single module aftertreatment solution exclusively developed for BSVI engines, besides meeting emission requirements is said to be 60 per cent smaller, and 40 per cent lighter than modular aftertreatment systems offered by competitors. The advanced AUS32 dosing and mixing technologies Cummins is offering, are claimed to drive higher efficiencies in terms of NOx conversion. The objective of the company, claimed a source, is to be a one stop shop with complete engine solutions. In its bid to provide complete engine solutions, Cummins has developed a telematics interface to address changing market requirements in the area of remote diagnostics, prognostics and more.